Place 2 tablespoons of the milk in a small bowl, whisk in the cornstarch to make a slurry and set aside. Add the remaining milk into a heavy saucepan and bring to a boil over medium heat. Pour in the slurry, corn syrup, sugar and salt, stirring gently. Return the mixture to a boil and whisk in the chocolate until completely smooth. Transfer into a bowl and let cool to room temperature. Once cooled, mix in the vanilla extract. Cover and refrigerate for at least 3 hours or preferably overnight to make sure it is completely chilled. Whisk the base and then pour it into your ice cream maker and churn. The gelato should be the consistency of soft-serve ice cream, so don’t churn it as long as you would to make a regular type ice cream. Store in the freezer, with plastic wrap pressed onto the top, and let it be at room temperature for 10 minutes before serving, to make scooping out easier. Comments: If you are a chocolate lover, you’ll love this recipe! It feels rich in your mouth, even though it contains no heavy cream in the base. The proper way to indulge it is with eyes closed, paying attention to the many changes in taste and texture as the gelato melts in your mouth, and brings happiness to your soul. I’ll admit I don’t have an ice-cream maker, although my sister has one, and the base has been in the freezer for a week, waiting for a recipe to begin. This sounds just what I need and the children do love chocolate…thanks for the recipe. 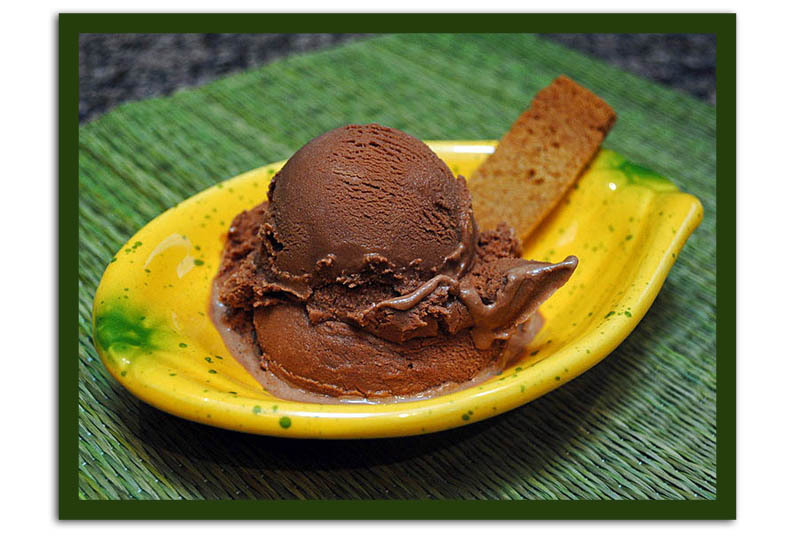 I truly understand you when you say close your eyes and taste the flavor and texture… bring on the choco happiness! Hope your sister gives it a try, or you go there and make it for the whole family. It’s delicious! this looks so delicious..and so good that it has no cream or any eggs in the mixture..it’s my son’s birthday in 3 weeks and he is a huge chocolate fan so i really will be doing this..thanks.. I also prefer a slightly less indulgent formula, and this one had it all. Ok, now you’re going too far. I’m enormously jealous of your ice cream maker -there I said it! (love the little bit of chocolate melt in the photo). So great! até eu que não sou fã de sorvete de chocolate, queria um para mim. Angela, ja’ nos ‘falamos’ por email, obrigada pelo comentario e a dica do seu programa na tv! Muito incrivel! My kids would like to head over and enjoy this. They are both choco-holics. 🙂 It looks fabulous (even if I don’t eat chocolate). The texture looks amazing! Actually, I was not as much in chocolate as after marrying Phil – he converted me into a choco-lover all the way. That looks great. I have so far resisted the temptation of purchasing an ice cream maker but it is getting harder and harder. I love my ice cream maker. I’m lactose intolerant and I use Lactaid milk so I can have ice cream again! I store the bowl in the freezer. We can make ice cream quickly if we get unexpected company. I’ve been looking for a recipe that is not as rich as the premium ice creams, but smoother than the basic recipes. Going to try this. Thanks! Thank you for posting this recipe– my refrigerator is failing, so I had a lot of whole milk to use up, but no cream– and voila, you post the perfect recipe to use up this milk. This gelato is deliciously chocolatey– possibly too much so for nighttime consumption, so my daughter and I may have some for breakfast. I found a link with recipes for “lower fat” ice cream, and they use a lot of milk alternatives like almond milk – I wonder if you could just adapt a few of these recipes to regular milk? anyway, I just ordered Lebovitz cookbook (The Perfect Scoop), and once I get it, I will get back to you on this, ok? Mine is not in the least bit grainy, and has so much flavor and is so creamy with only using milk instead of cream and eggs. I only used 60% chocolate as that is what I had, so I suppose it would even be better (but how could it possibly be) with the 70%.